What is the difference between a lightweight, medium weight and a heavyweight court wedding ring? Buyers rarely realised that most wedding ring styles are available in several thicknesses. The three standard depths for most profiles include light weight wedding rings, medium weight wedding rings and heavy weight wedding rings. Most importantly, the depth affects the overall weight (along with the width and finger size). Gram weight is the single most important detail affecting the final price. 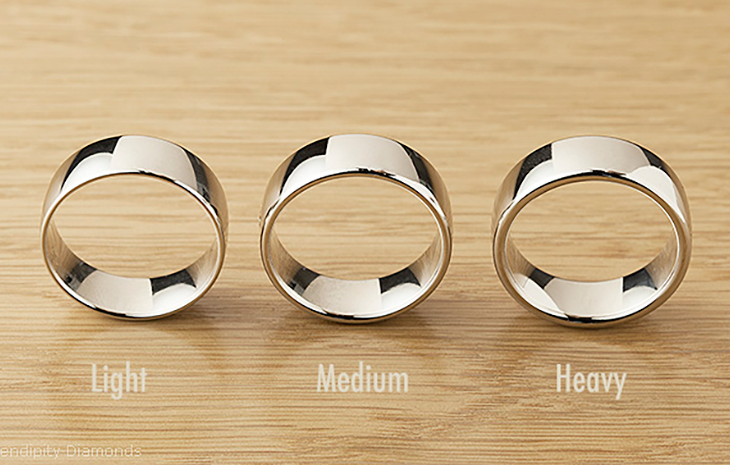 The chosen width of your wedding ring. Light weight wedding rings, medium weight wedding rings and heavy weight wedding rings all vary in thickness by approximately 0.5mm. The images will take you directly to the ring designs. Also known as low profile. In a typical light weight court profile wedding ring, this style has a depth of 1.3mm making this the thinnest option. A slim wedding ring can have two main advantages. 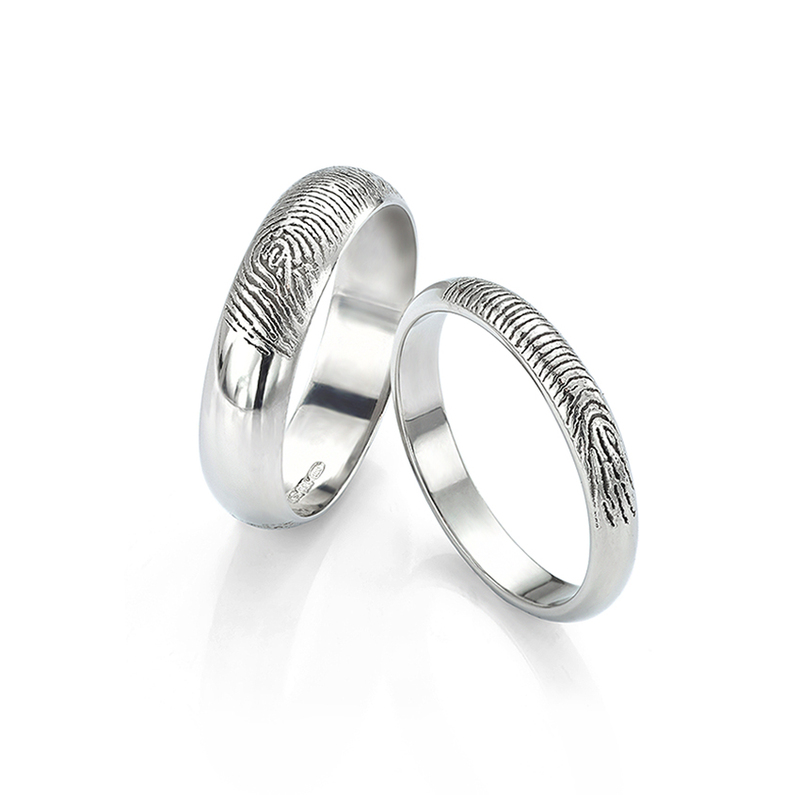 Platinum wedding rings in this style will be lighter and much more affordable. Secondly, being thinner and lighter on the finger, the wearer will find the ring less noticeable with a more comfortable feel when fingers are closed. Not necessarily suitable for women, unless the engagement ring band is a lighter weight. (Depth differences should ideally be avoided.) Lighter profiles are an ideal solution where a much wider men’s band is required, at a lesser cost than the equivalent in a medium weight design. A medium weight court profile wedding ring is probably the most popular. 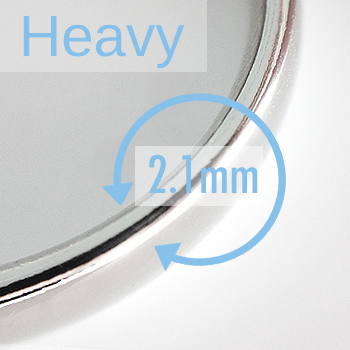 The thickness (also referred to as depth, gauge or wall) will typically be 1.7mm. Medium profile rings offer a nice balance of weight without being too light or too heavy, and slimmer widths are most popular for matching to standard engagement ring bands. Medium weight bands are available across the broad, in almost all profiles of a wedding ring. These are often listed as a standard weight wedding ring, but beware of lighter weight designs masquerading as medium weights, since metal weight is a governing factor to price. The depth measurement should indicate whether the band is light or medium weight. Proving popular for men’s Palladium wedding rings especially, heavyweight wedding rings are ideal for large fingers in greater widths. They offer a chunky feel with a depth typically 2.1mm or more (based on the court profile again.) The heavyweight wedding ring designs are also popular where diamonds are being added to a ring, because they offer a setting depth that will accommodate smaller diamond sizes. Princess cuts especially require a heavy ring profile on account of their depth. Diamonds set into lighter profiles will protrude through the underside of the ring. Jewellers will often check the diamond depth initially before selecting the most appropriate depth of band for the setting. If you would like a heavy-weight wedding ring without the cost of a heavy ring (owing to the extra gram weight of the metal) we have two suggestions. Firstly consider 950 Palladium for your wedding ring. This lighter metal will most likely work out to 50% of the weight and cost of Platinum. In addition, it will be far more durable than Silver or 9 carat Gold. Another suggestion is to look at Titanium wedding rings which come in an incredible amount of styles. It is possible to get a wide, solid, heavy looking ring. 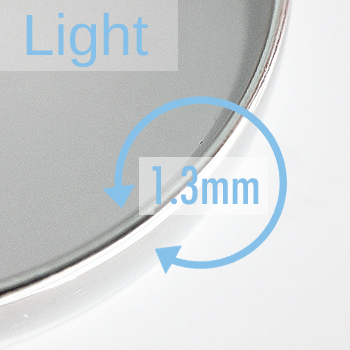 Light in weight, the substantial look is available at a fraction of the price of a precious metal wedding ring. 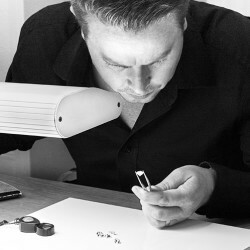 If you are considering an engraving, we suggest choosing a medium weight wedding ring. This is particularly important when selecting a fingerprint wedding ring. A medium weight wedding band will allow plenty of depth for the laser etched print without weakening the plain band. View examples below or find out more on our dedicated fingerprint wedding ring page explaining how we turn a wedding ring into a fingerprint ring. Medium weight wedding rings engraved with fingerprints as part of our bespoke wedding ring service.